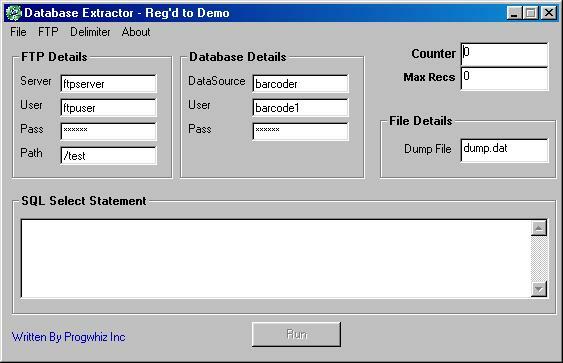 This Database extractor utility was engineered with automation and simplicity in mind. In this demanding business world ever rapidly changing, requires us to constantly upgrade and optimize infrastructure. This ultimately leads to the need to migrate information (data) onto newer high tech platforms. This Database utility was engineered with automation and simplicity in mind. In this demanding business world ever rapidly changing, requires us to constantly upgrade and optimize infrastructure. This ultimately leads to the need to migrate information (data) onto newer high tech platforms. This until now required acquisitioning of external resources with specialized skillsets to get the 'Job Done'. Happily now this can be afforded to anyone with basic SQL skills. The utility interprets the query and automatically populates a file with all the fields requested. Simply and Effectively, regardless of the SQL database. Once an ODBC driver is setup on the particular PC the utility is being executed.